Welcome to the new version of this site! This new version will allow for smoother updates and a faster and more convenient way for this webmaster to get information to you on all things KSR! It also integrates the information of the news, reviews, and encyclopedia in a single portal, making connections and cross-referencing (and protection from spam) smoother and making discussions and interactions and content featuring easier. In short, future-proof. Launched over six years ago, KSR.info still aims to be an open collaborative site, with content written/created/submitted by its members. What used to be the "MangalaWiki" is accessible here. For some time now the wiki had been closed to modifications, with this new version it is no longer the case. Learn more about how you can contribute here. You don't have to be tech-savvy to provide your input or suggestions, and if it still is too daunting there are always the comments in every page or the contact page. So, take a look around, and make use of the social media! You can see Stan's personal selection of his favourite talks/interviews, skim through the archival list of interviews, refresh your memory about Sax, find out the meaning of 'Haj', and much more... There is quite a bit of content on the Mars trilogy and The Years of Rice and Salt, with more content on the way -- the site is an ongoing work. Aurora is a story. Like any story, how you tell it is important. Aurora is a good story, but the telling is reminicsent of a racoon that knows a meal is under the lid but can't quite lift it to get the whole bite. After all was gone through with the group that got back home, what happened to the ones left behind? a movie. 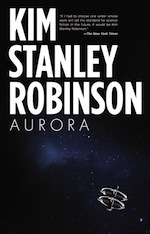 Aurora teased like it might be that sintering but ended up teetering between the language and character of a four year old character and teen science fiction. There were times in the book that it seemed like it would change but never quite ironed out.